Asics’s marketing pitch: Delivers energized cushioning and exceptional comfort from heel to toe. Upper: Engineered mesh, fused urethane, external plastic heel counter. Midsole: Triple density midsole with a firmer medial post, visible Gel, and two types of Flytefoam. Plastic midfoot shank. 10 mm heel drop for men's, 13 mm for women's. This version marks the Kayano's twenty-fifth anniversary. At a fundamental level, little has changed over the years; the multi-density midsole has the familiar medial post and a motion-control ride character. Of all running shoe brands, Asics and Mizuno are the most predictable. Even major model updates are accompanied with an overwhelming sense of familiarity. The kind which flows from a product creation philosophy based on incremental changes. There have been exceptions. Take for example the ill-fated 33 series, which, we believe, was based on requests from the North American retailers. Asics hurriedly cobbled up the assortment and that didn’t end very well. Perhaps it’s the Japanese way of doing things. Asics and Mizuno are very fearful of upsetting the status quo, and in a way, it’s best for all of us. At least we know what to expect. If Asics were a North American company, the 10th, 20th, or 25th-anniversary editions of shoe would be promoted through millions of dollars of marketing. Also, the shoe in question would have design changes which would leave the loyalists struggling to accept the new reality. But fortunately (and unfortunately), Asics is Japanese. 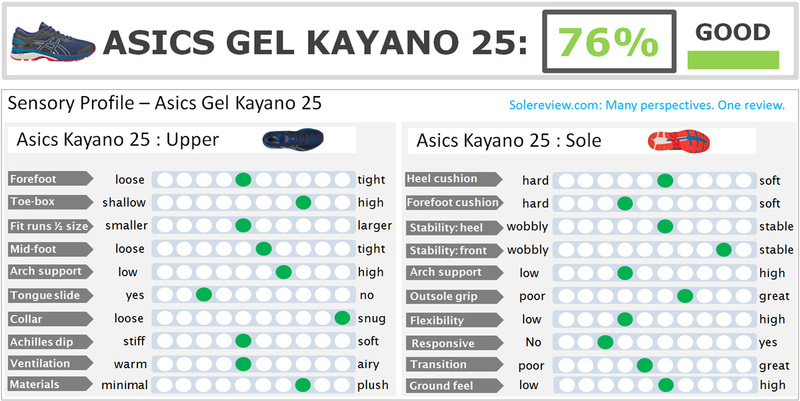 So at its core, the 25th version of the Kayano stays very similar. The triple-density midsole has a firmer medial post with Gel inserts. Mind you, this is categorized as a ‘stability’ shoe; this means that the inner midsole is firmer than the outer side. 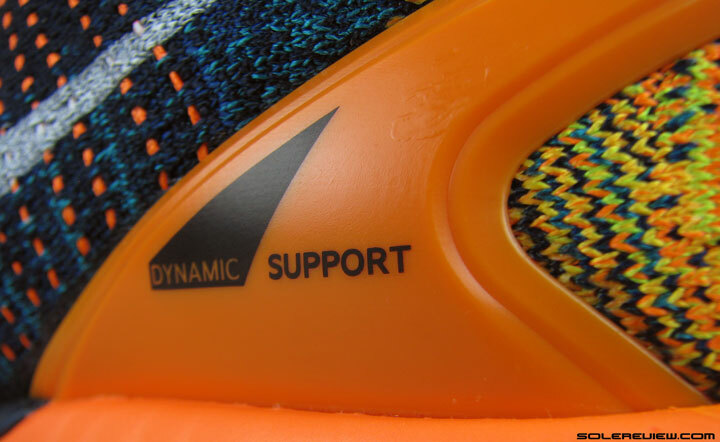 As a result of this configuration, the midsole has a bit of an outwards compression bias. The upper has a large external heel counter (like the last year) and is built using an engineered mesh with filmic overlays. While being broadly similar to the 24, the Kayano 25 introduces several changes. The upper gets a new last along with thinner overlays so there’s a minor increase in forefoot and toe-box room. The midsole gets rid of the visible forefoot Gel and uses a single-density Flytefoam Propel, a new compound which is also used on the Cumulus 20. This update leads to a shortened medial post and also a change in the ride character. 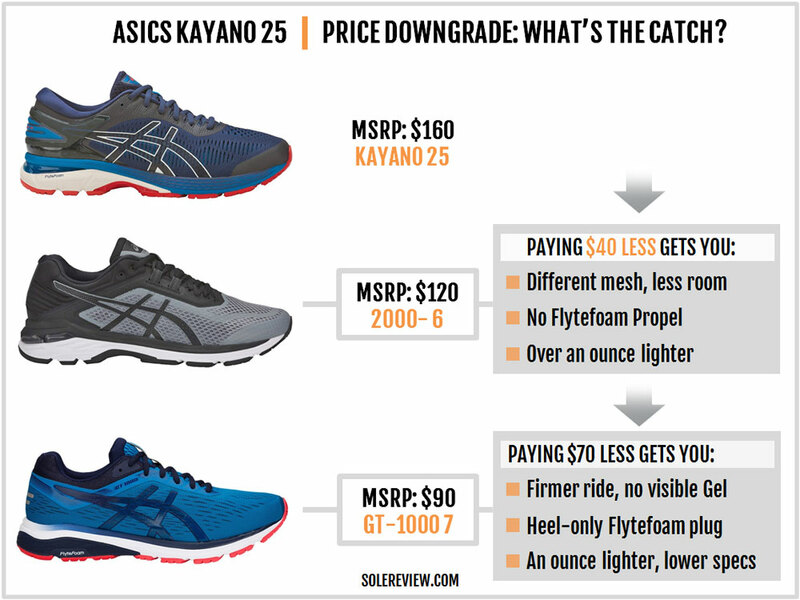 Like most Asics updates, the need to ‘upgrade’ to the latest Kayano is debatable. If you like your Kayano to have more forefoot space, then the K-25 makes a good case for itself. On the other hand, if a traditional motion-control shoe is all that you’re after, then the Kayano 24 will do all that the 25 does. 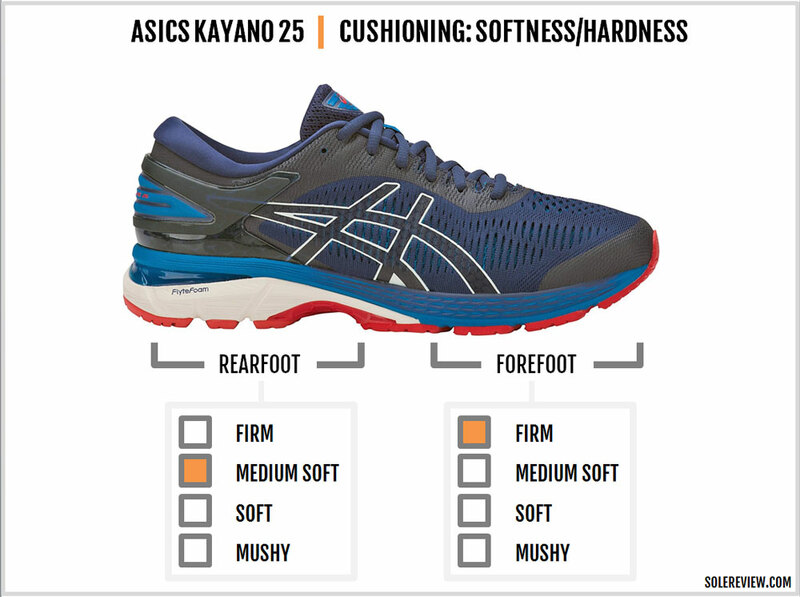 The Kayano 25 is also a half-ounce heavier than the 24 and the ride quality isn’t as smooth. Like they say – you win some, you lose some. For the first time, the Kayano gets a single-density forefoot. The K-24 had a full-length Flytefoam midsole along with another layer of EVA atop it. Visible Gel pads were located both in the front and rear. Instead of the dual-stack of forefoot foam, the Kayano 25 has a forefoot which is made entirely of Flytefoam Propel. Not only that, the visible Gel has been removed as well. Not that it mattered functionally; the forefoot visi-Gel had always been a decorative element. There’s a dime-sized Gel pad hidden inside the forefoot which also doesn’t affect the cushioning. The visi-Gel pads are being removed across the Asics assortment. The Cumulus no longer has the forefoot window, and models like the GT-1000 no longer have even the rearfoot insert. Completely removing outer Gel from a sub-$100 model is understandable. However, we’re not sure whether this is a good move for shoes which cost $160. The forefoot visible Gel has a negligible role in the ride quality, but shoes are as much about aesthetics as it is about function. So what’s the Flytefoam Propel? We don’t know. It lacks the fibrous texture of the regular Flytefoam, and the version used on the Kayano is firm. Asics claims that the Propel offers ‘supreme bounce,’ but our experience didn’t match that description. On the contrary, the Kayano 25’s forefoot is firmer and flatter in feel than the K-24. The 24’s dual-stack produced some degree of softness. The Propel also seems to be the reason why the 25 is nearly a half-ounce heavier than the 24. 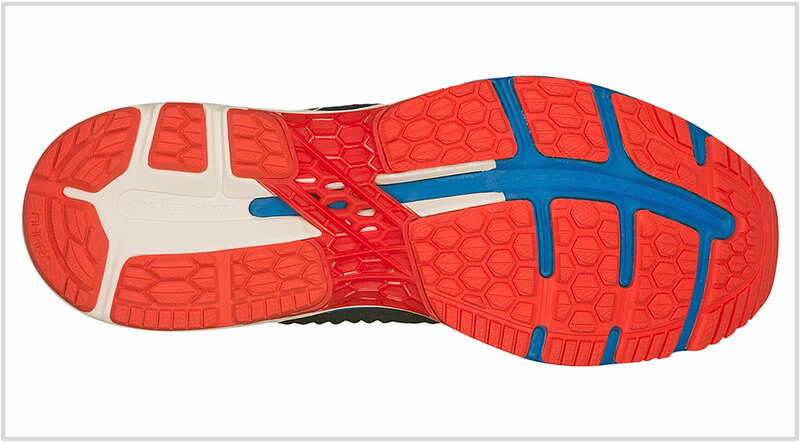 The outsole update includes the bridging of the forefoot flex grooves. The outsole lugs are connected by a thin rubber channel, and this means you don’t get the clean flex grooves of the 24. The Kayano was never a very flexible shoe, and the 25 is more of the same. The forefoot takes some effort bending. And just how does the redesign impact the ride experience? From a comfort standpoint, the forefoot cushioning is a step down from the 24. The ride is firmer and not very responsive. However, when seen from a transition point of view, the Propel-infused forefoot has its advantages. Forefoot loading and toe-offs feel quicker on the 25 than the last few Kayanos. It feels easier to pick up the pace on the new Kayano. The blown rubber outsole in the front has decent traction performance under most conditions. The single-density forefoot also happens to be more stable than the K-24. And as always, we say that relatively. The 11.8-ounce Kayano 25 is a super-heavy shoe by present-day standards, so there’s always this feeling that you’re running in ‘more’ shoe when compared to, say, the Brooks Adrenaline. Simply put, the Kayano 25 is more ‘blocky’ to run in. The rearfoot has a lot going on; there’re actually four different material densities. There’s the softer base which Asics now calls Lyte Flytefoam (a tongue twister, no less). The rearfoot Gel component forms both as the visible and the embedded portion. Then you have the top layer of Propel, and finally, the inner midsole has the firmer (Duomax) wedge. Bridging the midfoot is a ‘Trusstic’ plastic shank, a common sight in many Asics models. If you’re looking for cushioning softness, most of it is packed inside the rearfoot. The layers of foam and Gel lead to marginal softness, and that’s helped by the split outsole crash pad and the underfoot cavity. A soft Ortholite insole and an EVA foam strobel deliver superficial softness from the heel to toe. But underneath all that is a firm forefoot and a relatively softer heel. And this difference in character is what makes the Kayano 25’s transition quality less smooth than the 24. When transitioning from the rear to forefoot, you get this sense that you’re abruptly switching from a softer to a firmer zone. 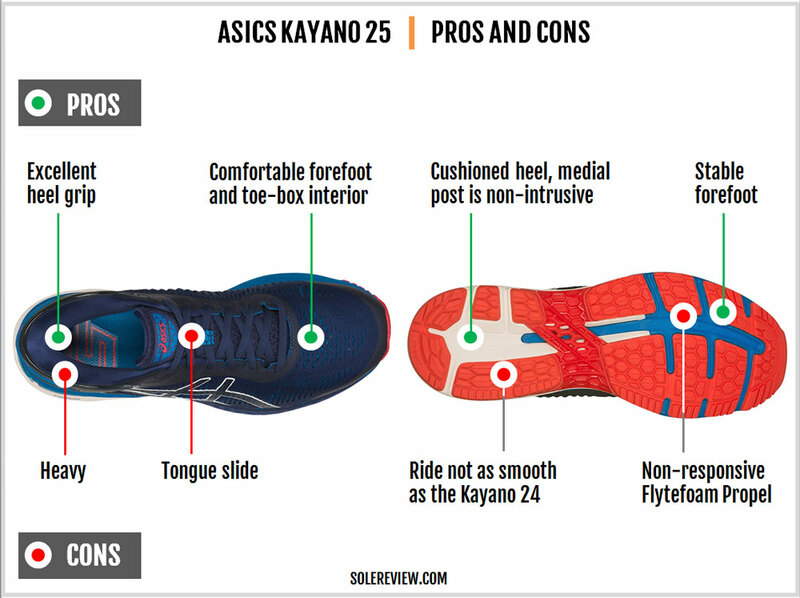 This wasn’t so obvious on the Kayano 22-24 because the stacking of the two foam was consistent along the shoe’s length. With a 100% Flytefoam Propel forefoot, the stacking stops right at the midfoot. The ‘guidance line’ on the outsole is helpful, but it can only do so much. Also worth noting is that the 25 has a shorter and smaller medial post than the past Kayanos. This is because the Flytefoam from the rearfoot doesn’t extend all the way to the front like the 24. Since the forefoot is made of a different foam, the under-arch wedge (Duomax) stops right above the plastic shank. Now look, we’re aren’t sold on the concept of stability shoes with their medial posts and all. That’s beside the point though. Runners who buy the Kayano like the sensation of the firmer under-arch area, functional or not. 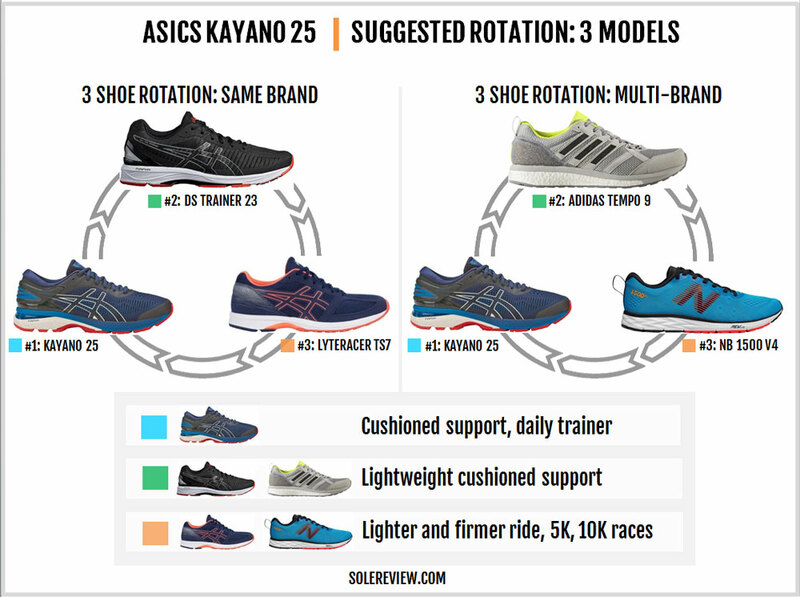 For Asics loyalists, the 25 is less of a Kayano due to its downsized wedge. Also, the future of the Trusstic shank is in question, going by how the rest of the industry (and even Asics) is ditching that component. Ironically, the word stability is a misnomer. In the Kayano’s case, ‘stability’ is achieved by compensation; a softer outer side balanced with a firmer inner midsole. So you won’t get the support levels of, say, a Saucony Guide or Nike Structure, because the Kayano is a motion control shoe. So if you intend to buy this shoe, you should really know your Kayano. This is a product with limited versatility. It’s not the softest nor the most supportive. And it’s hard to run fast when you’re lugging nearly 12-ounces per shoe. The Kayano 25 is a traditional motion-control shoe with a slightly biased rearfoot cushioning. There’s plenty of dense padding for long runs (including marathons) at easy paces, and that’s all you can use it for. It also suffices for daily casual use. And if you’re a female runner, it’s worth underscoring that your Kayano has a higher heel stack. The Women’s Kayano 25 has a heel height of 24 mm and an 11 mm forefoot, making it a 13 mm offset shoe as opposed to 10 mm of the Men’s model. On the surface, the upper changes might not appear like much, but there are important updates. The Kayano 25 uses a new mesh and thins down the fused overlays. 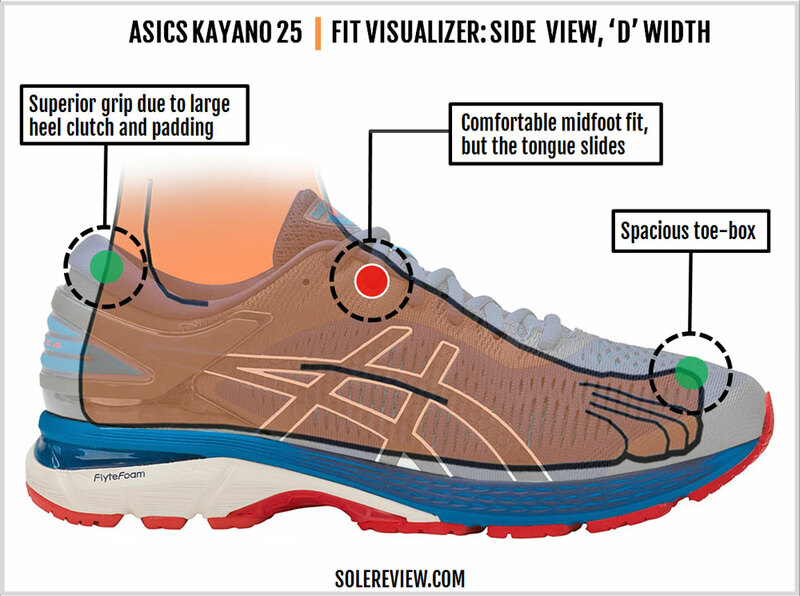 In the rear, the redesigned external heel counter is modeled on the Kayano 24. Most of the forefoot and midfoot upper lacks external layering. Like the last year’s model, the toe-bumper and the lacing area are covered with thin, filmic laminates – except that the Kayano 25 uses an even thinner version. The new Jacquard mesh results in a softer foot covering than the 24. The new mesh and the thinner layering makes the upper more pliable than the 24. Lest we forget, we should mention that the Kayano 25 uses a new last which opens more up toe-box and forefoot room – albeit marginally. It does help that the Kayano is available in many widths, but the standard ‘D’ width now comes with a wee bit more room in the front. It is still snug due to the thick mesh, but then again, this is purely a comparison with the 24. Even the Asics logo on the outer side is thinner, and the medial side lacks any logo at all. For a shoe which retails at $160, this is unacceptable cost cutting – this isn’t the GT-1000. For a shoe which lacks structured overlays, the side logos perform a role other than a cosmetic one. The logos provide structural support to the upper, resulting in a streamlined aesthetic. In the absence of the medial side logo, the Kayano 25’s upper looks puffy in its resting state. 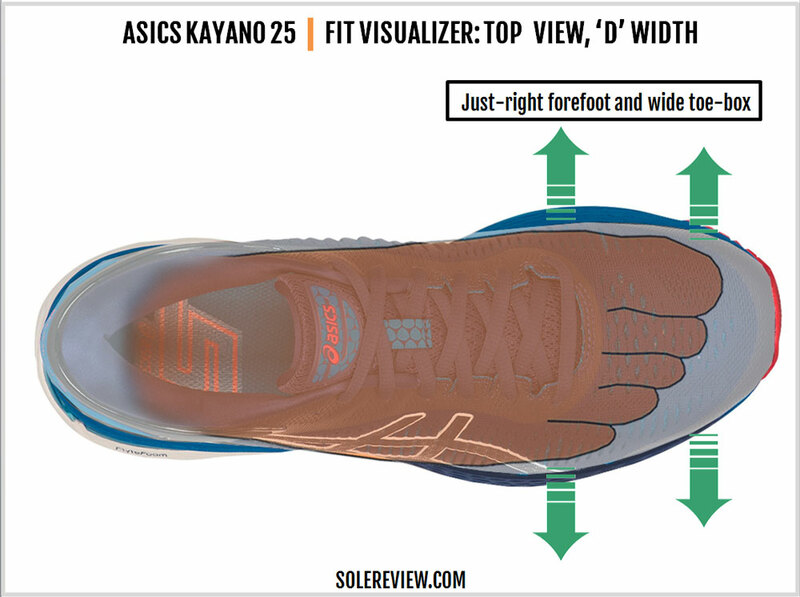 The forefoot and midfoot have inner underlays like on the Kayano 24. While they are functional from a support perspective, they do not help with the structure of the external upper. The Kayano 25 fits true to size, but barely. The heel has an external plastic clutch similar to the 24. When paired with the narrow heel molding and plush padding, the heel tends to position the foot a bit forward. This design affects the toe-box space. 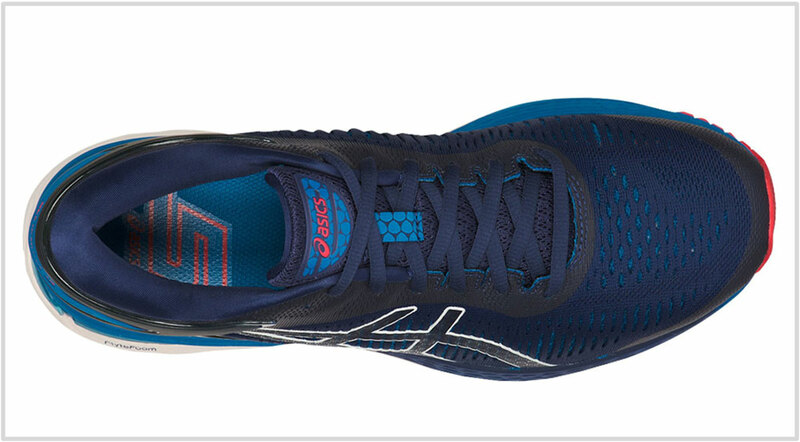 As far as the heel fit is concerned, the Kayano has a vice-like grip. The outer heel clip does its job extremely well, cupping the foot from either side. Its edges also extend under the visible Gel, so you know that it’s more than just skin deep. There aren’t many running shoes these days which use such a structured heel. 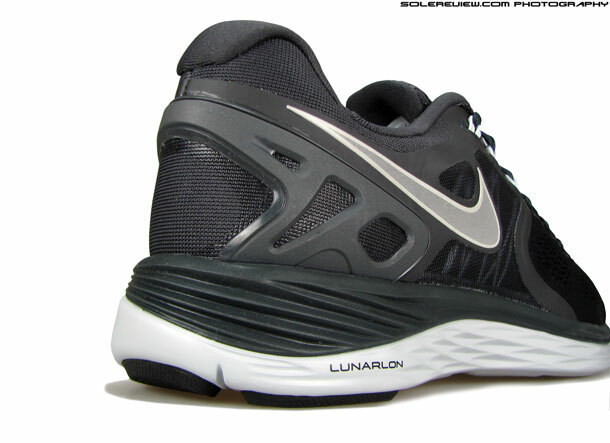 Till a few years ago, there were models like the Nike Lunarglide or the Lunareclipse. Rigid heels aren’t for everyone – especially those who want a more pliable Achilles area. But on the other hand, some runners look for shoes with a heel frame, and the Kayano happens to be one of those products. Some things stay the same. The tongue is not sleeved, which means there’s a fair degree of slide. Otherwise, the tongue is well quilted with foam and cancel the pressure applied by the soft round laces. Reflectivity is present on the Kayano, with most of it over the outer heel frame. 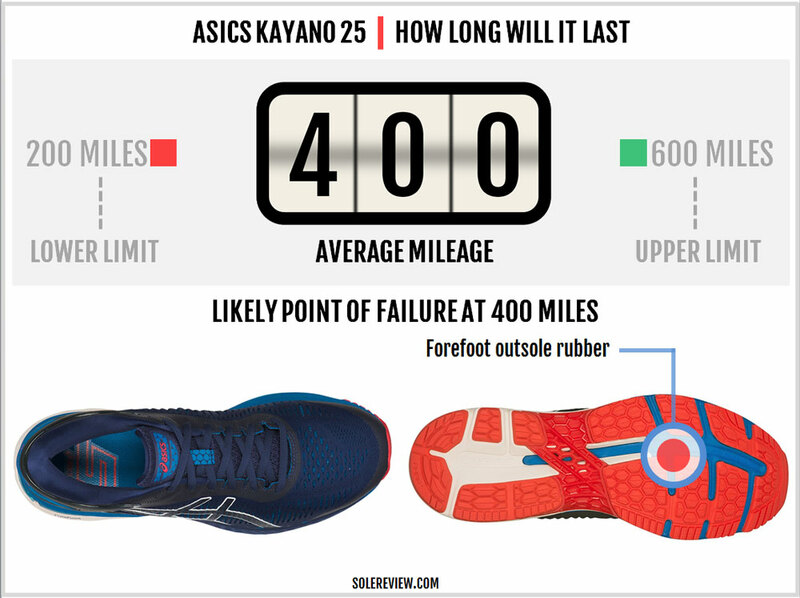 Given the Kayano 25’s overall similarity to the outgoing version, the lifespan will be more or less identical. The upper lacks external layering but appears fairly durable. The wear and tear on the outsole will happen gradually in high-wear zones such as the forefoot and rearfoot transition area. Also, the Kayano 25’s forefoot midsole should retain its cushioning longer than the 24 due to the firmer and single-density Propel foam. And if you feel that the cushioning has gone ‘flat’ after a few hundred miles, that’s more likely because of the blown-foam insole compacting than anything else. 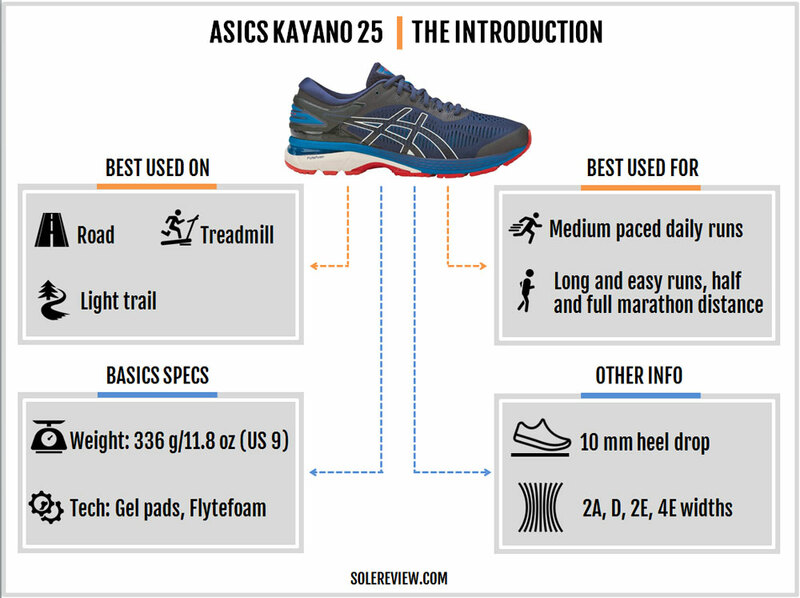 There are several things which the Kayano 25 does well. The upper is a comfortable place to be in. The new last opens up space in the front, and the overall materials package feel plush. The heel grips very well due to the external clip and the internal padding. That being said, tongue slide isn’t fixed yet. The medial-post has a non-invasive feel to it due to its smaller proportions. 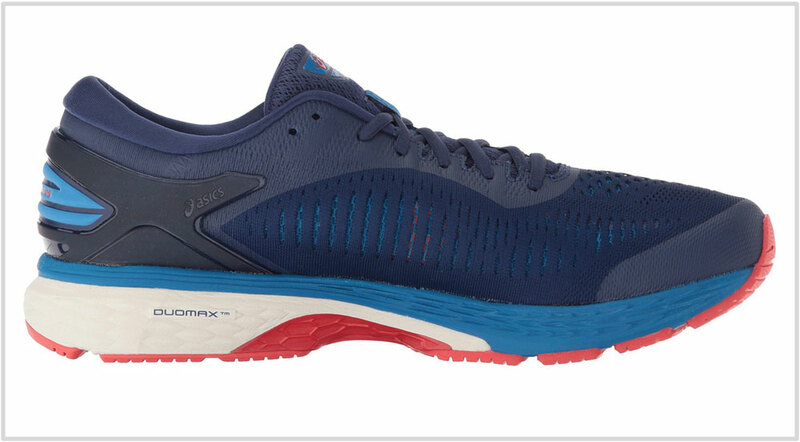 It’s also topped by the layer of Flytefoam Propel which prevents the firm wedge from pressing into the foot. A Propel foam forefoot makes the front very stable as well. The Flytefoam Propel claims to deliver ‘supreme bounce,’ but we’re not sure what benchmarks Asics is referring to. Compared to the adidas Boost, Nike React, and Reebok Floatride, the Flytefoam Propel is firm and mostly unresponsive. And given the front and rear midsole have completely different architectures, the ride quality comes as strangely disconnected. In fact, the Kayano 24 felt better as far as the ride smoothness was concerned. Also, the Kayano weighs nearly 12-ounces. That’s a lot of weight by contemporary standards, and unsurprisingly the Kayano feels like a lot of ‘shoe’ during runs. 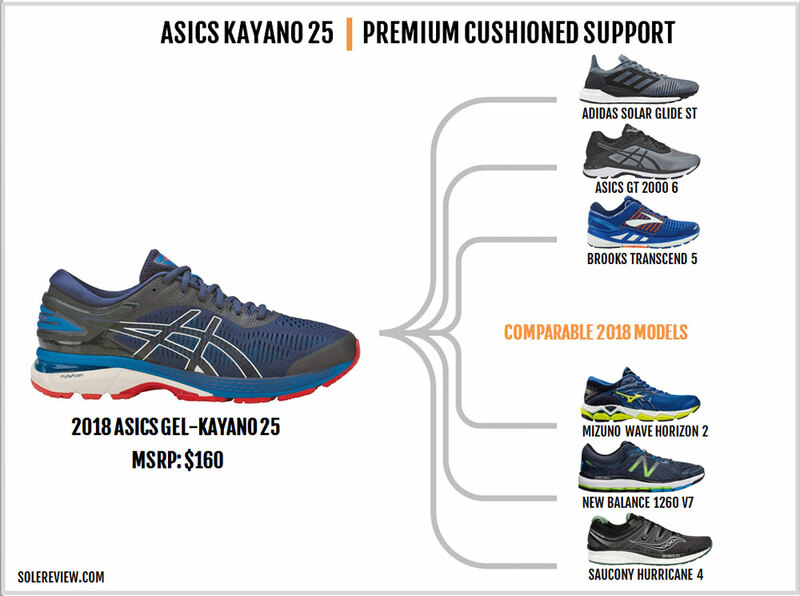 The Kayano, the GT-2000, and GT-1000 have represented Asics’s support shoe category for a long time. Before the GT 2000/1000 area, you had the 2160 and 1170 as their equivalents. 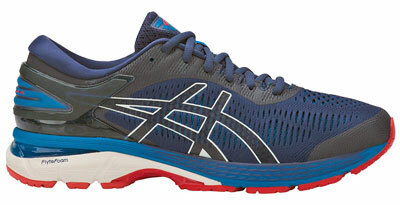 Of course, there have been other Asics running shoes with a medial post, but these three are the most popular. The Kayano is at the top of the food (shoe) chain, followed by the 2000 and then the GT-1000. The long-continuing tiering strategy doesn’t change this year, except that the gap between the models widens a bit. For instance, the Kayano now has Flytefoam Propel whereas the GT-2000 does not. Besides that, the Kayano has a roomier toe-box with plusher interiors and a softer ride. Interestingly, the GT-2000’s ride feels smoother than the Kayano due to its uniform dual-foam stack. In comparison, the front and the rear of the Kayano feel disconnected due to the Flytefoam Propel forefoot. The GT-1000 7 gets significant updates for 2018. Firstly, it gets a Flytefoam heel crash pad. Second, it loses visible Gel in its entirety, instead relying on an invisible rearfoot insert. This set-up makes the GT-1000 the firmest of the three, along with the lower material spec which comes with the price segment. The GT-1000 7 also uses an interesting variation of the Trusstic midfoot shank. Instead of a full plastic piece, the medial side is just an extension of the outsole. The Kayano 25 is a cushioned but heavy running shoe. Given its limited range of use, consider getting yourself the DS-Trainer 23 if you need a lightweight trainer for faster runs. The DS’s got a full-length Flytefoam midsole, making it much smoother and lighter than the Kayano. While you can also race in the DS Trainer, the Lyteracer TS7 is a better choice. With a low-profile midsole and a snug fit, it’s an even lighter road-racer for speed days. Adidas sells the adizero Tempo 9, a cushioned trainer for faster miles. The medial side of the shoe is equipped with a mild-support feature, and that’s the reason why we recommend the Tempo over the Boston. And far as mild-stability road-racers go, no shoe does it better than the New Balance 1500V4. There’s no dearth of cushioned support shoes; this is an extremely popular and well-established footwear category. There are plenty of models which combine a firmer medial post with a high-volume midsole. The Saucony Hurricane ISO 4 marries a medial wedge with a full-length Everun foam midsole, resulting in a deeply cushioned ride. The New Balance 1260V7 follows a similar template, except that its midsole is made mostly of an EVA foam variant. There are two shoes on this list which do not use a medial post. The Mizuno Wave Horizon 2 has a modified Wave plate to make the inner side more supportive. The Brooks Transcend 5 takes a different route as well. Brooks uses an ultra-wide midsole and outsole along with raised EVA rims for support. The DNA foam midsole packs plenty of cushioning too. The adidas Solar Glide ST better qualifies as a neutral shoe than stability, but at this moment, that’s all what adidas offers. The Boost midsole delivers a softly cushioned ride and EVA rims make the shoe adequately supportive. And finally, we’ve included the Asics GT-2000 6 here because of its shared materials and design format. When compared to the Kayano, the toe-box is a bit of a squeeze to get in though.